Daytona Beachs Grand Resort is the Plaza Resort and Spa. Originally built in 1888 the Plaza has been serving guests from around the world for over 130 years. Majestically set above a stretch of traffic-free beach and winner of the prestigious Trip Advisor Certificate of Excellence the Plaza is your finest choice for comfort service and value. The Plaza offers you a wide variety of spacious rooms and suites most of which provide dramatic views of the Atlantic Ocean and the Plazas ultra-large family fun pool deck. You will also find tasteful dining options and Ocean Waters Spa the areas largest full-service spa. Making your visit extra special will be the Plaza Resort and Spas friendly and attentive staff. For conferences weddings and special events of all types the Plaza is perfect as one of the areas largest meeting venues 40000 square feet of space serving the finest banquet food and beverage on Daytona Beach. Contact our group and catering sales team at 386-255-4471 to create a most memorable event. Whether you are traveling for family-fun business or some time alone with someone special the Plaza Resort and Spa will exceed all of your expectations. Book here and find the best rates available for your next visit to Daytona Beach. We look forward to serving you. The Plaza Resort and Spa is located on Daytona Beach at 600 North Atlantic Avenue Daytona Beach Florida. 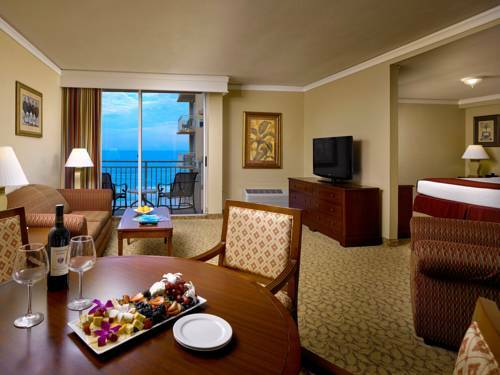 Daytona BeachThe hotel offers a stunning view of the beach itself from the comfort of our guest rooms. There is also direct access from our property to the beach for both pedestrians and vehicles. Daytona Beach Ocean CenterDaytona Beachs own convention center with over 205000 square feet available for concerts sports conventions graduations rodeos and other events. Daytona Bike Week / Main StreetBike week is a yearly event and rally celebrating motorcycling culture. The event features a week long-block party featuring music food and shopping that is held less than a mile from the hotel. Daytona International SpeedwayThe speedway is the home of the annual Daytona 500 as well as dozens of other events held all year round. Daily tours are offered as well as stock car truck motorcycle and go kart racing events. Ocean Walk ShoppesOpen-air shopping center with shopping movies restaurants and concert events. All just steps from the hotel the boardwalk and the beach. Daytona International AirportA county-owned airport featuring 3 runways a six-gate domestic terminal and an international terminal. The airport also encompasses various private air transportation companies as well as the Embry Riddle University Flight School. Bethune Cookman UniversityBCU is a private historically black university parts of which have been added to the US National Register of Historic Places. Embry Riddle Aeronautical UniversityERAU is a university offering classes and programs focused on aviation operation function technology and design as well as meteorology and other areas.